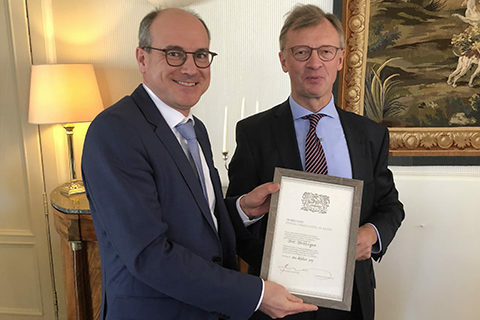 On February 7, 2018, Belgian Ambassador in the Netherlands, Chris Hoornaert, has awarded Professor Bert Weckhuysen a Certificate for Achievements (‘Oorkonde van Verdienste’) of the Christoffel Plantin fund for his contributions to the prestige and appeal of Belgium in the Netherlands. This honor was given during a luncheon with Belgian CEOs, CTOs and CFOs working for companies based in the Netherlands. The Belgian luncheon took place in the Ambassador Residence in The Hague. The Christophe Plantin organization aims to reward Belgian citizen who reside abroad, and who have made important contributions to cultural, artistic and scientific activities, thereby fostering the prestige of Belgium.